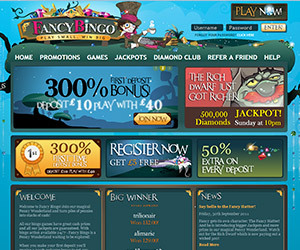 Join the magical Fancy Bingo for the most fabulous online bingo experience. This enchanted Penny Wonderland offers loads of bingo as well as the most popular slots and instant games. You will receive a generous 300% Welcome Bonus when you make your first deposit of just £10 – that means £40 to play with! 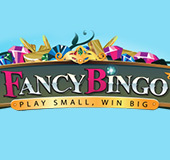 Fancy Bingo has both 75 ball and 90 ball bingo, so whatever your preference, you're bound to have a ball and to win big! Plus, there's also a fun variation of the traditional 75 ball bingo called 75 Ball More Winners Bingo, whereby there are no less than five prizes awarded per game! There's also loads of cash to be won monthly in Fancy's guaranteed jackpots, which means that someone must win every time – play today and that winner could be you! Bingo isn't the only thing that Fancy Bingo offers, though. You can also play instant win games such as scratch cards and video poker, table games, such as Roulette and Blackjack, and over 25 slots, super slots and progressive slots. There are loads of games to choose from and loads of prizes to win!